One day earlier this year, while looking in the mirror, I suddenly noticed my edges were thin and ugly but how did this happen? Did Wrapping My Hair Cause Thinning Edges? I truly did not know how I got here. Did wrapping my hair for all these years cause it? But wait, when did the problem start? A number of questions passed through my mind. Therefore, I looked through old photos with trying to identify the turning point. I finally found a photo where my edges looked great. This photo would serve as my start point for tracking down when my edges started to thin. It appears my edges thinned when I was under a lot of stress. Five years ago my husband had stomach cancer. When stressed, hair is the least of my worry. I don’t want to deal with it, see it, think about it or be bothered with it. 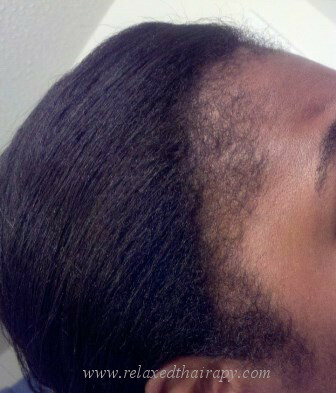 While in the midst of his cancer treatment, my hair broke off badly but my edges were in good shape at the time. In looking through photos, I noticed they started thinning gradually. Therefore, stress and neglect likely played a huge part. When moisturizing and sealing, we should ensure product is distributed to the edges and nape. Even with knowing that, I fell into a bad habit where I barely paid attention to them. As I’ve said many times before, dry hair is breaking hair. Therefore, failure to properly moisturize and seal was not helping the cause. After our lives settled down and we adjusted to our new normal post-cancer, I decided to seek treatment for my edges. My dermatologist advised me to minimize chemicals, use Rogaine and go natural. My stylist felt the follicles were damaged and regrowth was next to impossible. Determined to bounce back, I researched DIY methods for repairing thinning edges. I finally came up with a method that was reasonable, didn’t require me to hang upside down, use vaginal creams or stinky ingredients like onions or garlic. I pieced together a simple oil blend with oils known for promoting growth. If you try this oil blend, please patch test and adjust the ratio and oils accordingly. Jojoba oil mimics our natural scalp sebum and helps to restore our scalp. Lavender oil inhibits bacteria causing infections. Grapeseed oil contains antioxidants that block DHT, the hormone responsible for hair loss. Castor oil is believed to thicken hair follicles. Because I know scalp massaging helps to stimulate blood flow which promotes growth, I felt adding a stimulating oil blend should only enhance the experience. Therefore, I applied the oil blend to my scalp three to four times per week and massaged my scalp for five minutes every night, regardless if I used the oil blend. I continued this regimen for three months straight and my edges responded favorably. I also noticed increased growth in the length of my hair. Therefore, this is an excellent technique to use even when you’re not dealing with thinning. Scalp massaging is very relaxing and offers a lot of benefits, but it’s also a lot of work. While five minutes each night doesn’t sound like a lot to give for increased growth, I often felt it was an inconvenience. Therefore, once my edges were restored to a healthy point, I scaled back on the frequency of doing scalp massages. I now massage my scalp about three to four times per week. Have You Dealt with Thinning Hair or Edges? Be sure to check out the entire setback series…. Praise Him for your hubby’s restored health doll! When I was at the BHK Expo a few months ago, Pamela Jenkins, owner of Koils By Nature, mentioned using willows bark, eucalyptus, lavender, and JBCO to re-grow her edges. Once I banned brushing and started slathering my edges and nape in conditioner—They’ve thrived. Thanks for the info. I stopped brushing for a while but have since returned. I now use a baby brush. I don’t brush often though. My edges has always been a issue for me. Then again my moms edges are fine, my granmothers edges were fine and now mine. I would hate to say that its hereditary but I think it is. Do they look as bad as mine En? I originally included edges may be a hereditary thing but took it out after considering my family is not on a healthy hair journey & our medical situations differ. My mom’s edges bounced back tremendously after going natural, yet she’s still on meds for blood pressure, etc. The progress is good. Am trying to get mine back to normalcy. What are you doing Abena to get there? Do you mind sharing? major improvement! 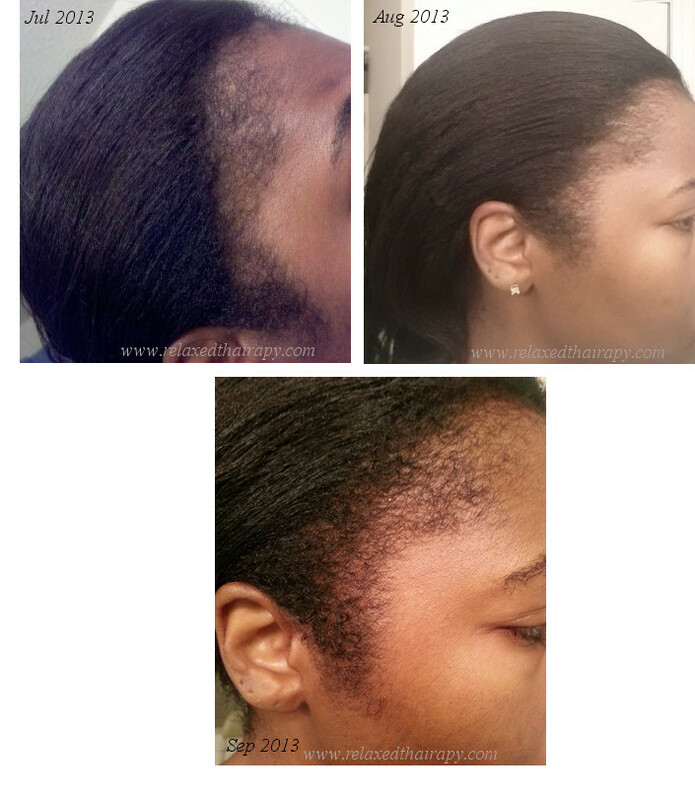 i recently suffered from postpartum shedding and it left my edges so thin, down to the scalp. they are growing back now. i am using JBCO a few times a week. i massage it into my scalp. i also have it in my prepoo mix. that’s one of the reasons i am holding off getting a touch up. that area is naturally fragile and i don’t want to add chemical stress to it. thanks for sharing your story! i’m glad you didn’t give up! You’re very welcome! Thank you for sharing your story as well. I’m glad yours are bouncing. It’s so easy to give up and become frustrated, but we didn’t. Yay for that. Have you given thought to not touching up the edges for now, at least until they strengthen. I’m looking to TU my edges only 1-2x year. I coat my edges really well so the relaxer won’t process (or minimally process) the edges. That way, the rest of my hair doesn’t suffer because while babying the edges. I have never had a problem with my hairline but the center of my nape is a different story. Castor oil and not relaxing the area for a while has worked but I’m not consistent with the castor oil like I use to be. Not relaxing probably helped more than anything. Make sure you hit that castor again.